Cool! dinosaur tracks! How can today’s slow-and-gradual geologic processes over millions of years explain the preservation of delicate impressions in mud before they are washed away? Does the Flood provide a better explanation? After all, with the Flood waters covering the entire earth, the dinosaurs would have nowhere to walk. Even if they did, the churning waters would erode away any footprints left behind. Secular geologists and skeptics often raise this question and are sometimes scathing in their mockery. Biblical geologists, on the other hand, say it is the conventional geologists who, in fact, face a dilemma. If geologic change takes place slowly, surely footprints made in mud would be obliterated by wind and rain long before the prints were covered by new sediments and hardened into rock. So who has a dilemma? 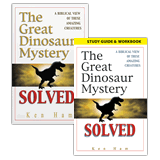 To find out, let’s explore a specific case of fossilized dinosaur footprints discovered in Israel. Figure 1 Left foot–right foot sequence of fossilized footprints. Just west of Jerusalem is the village of Beit Zeit. 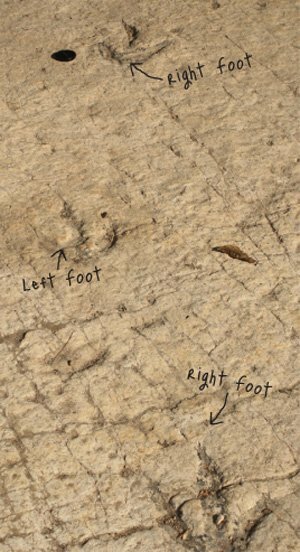 There on an exposed rock pavement, a left foot–right foot sequence of fossilized footprints is clearly evident (Figure 1). In a closer view the imprints of three long toes are plainly visible (Figure 2). Perhaps the most interesting clue about the formation of these footprints is the type of rock in which they are found. It is a unique type of carbonate rock similar to limestone, called dolomite. We see various types of limestone forming today, but dolomite requires unique conditions to form, as determined in the laboratory. Dolomite forms today only in small quantities and only in extreme environments where dinosaurs could not possibly have lived, such as hot springs and desert salt flats.6 All other theoretical environments where dolomite might form are likewise not places where dinosaurs could live (such as hyper-salty lakes and oceans with unusual chemistry). So conventional geologists, who believe that the present is the key to the past, would not expect to find dinosaur prints in dolomite. The best explanation they can suggest is that, for some reason, a dinosaur walked across an intertidal mudflat in an arid region (where there was nothing for him to eat!). Figure 2 Three long toes clearly visible. The problem is complicated by the vast scale of the rock deposits. The dinosaur prints are found in the lower section of a thick sequence of alternating layers of dolomite and limestone, half a mile thick (2,600 feet or 800 m), collectively called the Judea Group.7 Jerusalem sits on the Judea Group, which includes Mount Zion and the Temple Mount (Mount Moriah). The only known way to produce large quantities of limestone, such as we find in the Judea Group, is an ocean environment. The “easiest” way to form widespread dolomites, too, is an ocean, but the water must be of unusual chemistry. So the Judea Group probably formed in a vast ocean sitting over the entire region. This wasn’t an optimum place for dinosaurs to live! So, how did the dinosaurs make these footprints under the ocean? Everyone agrees that the dinosaurs were land-dwellers. So conventional geologists cannot explain why they were walking across an ocean floor. Furthermore, even if the dinosaurs somehow left footprints in soft dolomite mud on a shallow ocean floor, how would the water-saturated sediment harden to fossilize the footprints? This can be done in only two ways: by exposing the sediment to the air so that the water evaporates from the mud, or by burying the mud so that the overlying sediments squeeze the water out of the mud. How do Flood geologists overcome all these challenges? 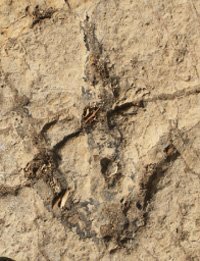 How could dinosaurs leave footprints in dolomite mud on a continent that was covered by ocean waters? Answer: a global flood! First, let’s explain the unusual chemical conditions. The pre-Flood ocean floor would have been littered with the remains of mollusk shells, in the form of lime. 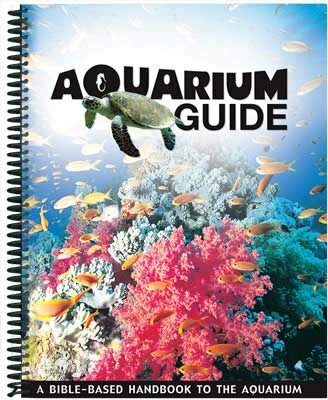 (Mollusk shells are made out of calcium carbonate, the main ingredient in lime.) When the fountains of the great deep broke up at the start of the Flood, massive earthquakes9 would have caused the ocean waters to rise and sweep in across the pre-Flood supercontinent, like tsunamis, carrying the lime sediments landwards with them. The water temperature would have progressively increased as hot volcanic waters were added to the ocean. Also, many volcanic eruptions would have added magnesium to the lime-rich Flood waters. This combination of hot water, lime, and magnesium would produce the layers of dolomite.10 Thus, catastrophic plate tectonics can explain the increase in Flood water temperatures, the inundation of the continents, and the formation of enormous amounts of “marine” carbonate sediments on the continents. At the same time, earthquakes and continental collisions would raise and lower land at different places and times. Consequently, warm surging waters of the catastrophic Flood might cover a particular lowland area with dolomite layers, only to expose that same area again for a few hours. This cycle could occur several times before the Flood finally covered the area completely. Some dinosaur prints may have been made by fully submerged dinosaurs, others in shallow water, and others on temporarily exposed surfaces. Any brief exposure would probably not provide enough time, however, for the soft dolomite layer, composed of a natural “quick set” cement, to harden sufficiently to preserve the footprints. Instead, the next surge of dolomite sediment would bury the footprints (even if still underwater), and the weight of the overlying layers would squeeze the water out of the dolomite and harden it to rock. The dinosaurs that made the footprints would again be swept away in the Flood waters. Within weeks or months, they would succumb to exhaustion and die, to be buried in Flood sediments higher up in the sequence. Flood geologists have a satisfying explanation for fossilized dinosaur footprints in dolomite layers. But conventional geologists, who insist on slow-and-gradual geologic processes, struggle to explain both the dolomite layers and the preservation of the dinosaur footprints. When we base our understanding of earth history on God’s Word, we can explain fossilized dinosaur footprints, even in supposed “marine” dolomite layers. The truth is much more exciting than man’s made-up history. Human life is sacred, from conception until the day we die. This issue focuses on a creation-based understanding of the sanctity of life and mankind’s violation of the Creator’s clear directives. 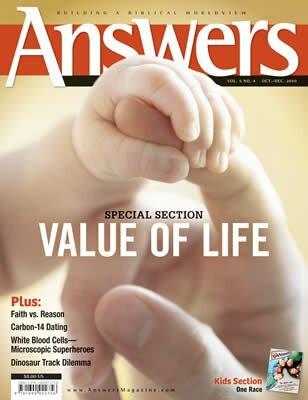 Feature articles explain when life truly begins, the shocking reality of human trafficking even in the West, and end-of-life decisions, such as living wills. Don’t miss this informative, edifying, and challenging issue! D. E. Gillette and M. G. Lockley, eds., Dinosaur Tracks and Traces (New York: Cambridge University Press, 1989). A. Thulborn, Dinosaur Tracks (New York: Chapman and Hall, 1990). M. G. Lockley, Tracking Dinosaurs (New York: Cambridge University Press, 1991). M. G. Lockley and A. P. Hunt, Dinosaur Tracks and Other Fossil Footprints of the Western United States (New York: Columbia University Press, 1995). 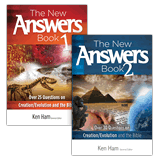 For example, “The Geo-Christian” at http://geochristian.wordpress.com/2008/10/28/dinosaur-footprints-part-3/. H. Blatt, Sedimentary Petrology, 2nd edition (New York: W. H. Freeman and Company, 1992), pp. 295–307. R. Freund, “The Judean Hills and Galilee Regional Synthesis of Sedimentary Basins,” in Sedimentology in Israel, Cyprus, and Turkey (Jerusalem: Tenth International Congress on Sedimentology, Pre-Congress Excursion A1, International Association of Sedimentologists, 1978), pp. 1–31; Y. Bartov and G. Steinitz, “The Judea and Mount Scopus Groups in the Negev and Sinai with Trend Surface Analysis of Thickness Data,” Israel Journal of Earth Sciences 26 (1977): 119–148. A. Sneh, Y. Bartov, T. Wiessbrod, and M. Rosensatt, Geological Map of Israel 1:200,000, 4 sheets (Jerusalem: Geological Survey of Israel, 1998). A. A. Snelling, Earth’s Catastrophic Past: Geology, Creation and the Flood, vol. 2 (Dallas, Texas: Institute for Creation Research, 2009), pp. 723–726. K. P. Wise, Faith, Form, and Time (Nashville, Tennessee: Broadman & Holman Publishers, 2002), pp. 170–175. J. H. Brown and A. C. Gibson, Biogeography (St. Louis, Missouri: The C. V. Mosby Co., 1983), p. 314. 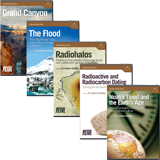 M. E. Clark and H. D. Voss, “Resonance and Sedimentary Layering in the Context of the Flood,” in Proceedings of the Second International Conference on Creationism, vol. 2, ed. R. E. Walsh and C. L. Brooks (Pittsburgh, Pennsylvania: Creation Science Fellowship, 1990), pp. 53–63. L. R. Brand and J. Florence, “Stratigraphic Distribution of Vertebrate Fossil Footprints Compared with Body Fossils,” Origins (Geoscience Research Institute) 9 (1982): 67–74; A. A. Snelling, “Order in the Fossil Record,” Answers (January–March 2010), pp. 64–68.